In the garage of the GBI Head Quarters, The coalition is working on prepping the equipment and loading up the Ectomobiles. Bill and Rich are in the brand new retro-fitted Winnebago Mobile HQ downloading the latest GBI Sat-net intel, when Andy Harness steps in. “Oh alright then.” and with that Andy Harness walks off thinking of how he’s gonna pull this flight off. Bill shuts down the laptop and secures it to the desk. Then he and Rich walk out of the RV and toward the 1953 Packard Henney Ambulance that GBNJ has used as it’s primary Ectomobile since day one. Bill starts the car and revs the Dodge Viper V-10. Rich straps himself into the front passenger seat and keys the mic on the CB. 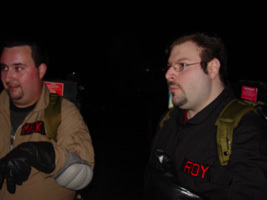 The garage door rolls open and the convoy of Ectomobiles pulls out. Bill is in the lead driving the aforementioned Packard Ambulance, next is the onyx-green PT Cruiser of GBNJ driven by Bill’s sister Stephanie, then the white Ford Expedition police package of the Maryland Ghostbusters, which was followed by the Mobile Containment Unit (a modified 1989 Ford Econoline Ambulance), and bringing up the rear was the Mobile HQ. The convoy pulls into the parking lot of Sickman’s Mill. There is no sign of the green PKE force-field. The members of the coalition are unloading the equipment. “Ha ha, you’re a funny guy.” Bill reponded, after quickly making sure the keys were attached to his belt. Winston Zeddemore and Ray Stantz approach Bill and Rich. “So what’s up with this force-field thing. Is it up or down?” Winston asked. The coalition forms outside of the Mobile HQ. Bill Malkin address the crowd. “Guys this is the moment that we have all been waiting for. We take the fight to Baccardio. Dr. Stantz and Spengler will be at HQ monitoring radio transmissions. Hopefully by now you all have hooked up the celluar receivers to our…uh…belt thingies. Dr. Venkman, my sister, and Amanda will be heading out to alert the local authorities and get some needed ground support. Winston and Dave will be blocking off traffic , and trying to get a more advantageous vantage point, and provide cover fire for our teams. Will, you’ll be leading team ‘Beta’ with Andy and Kevin. You guys will be tackling the trail and the old mine shaft behind the mill. Kyle, You’ll be on team ‘Alpha’ with Rich and I. We will be going into the mill. Let’s be careful out there, no causalities, got it? Any questions? Kyle grabs his pack and the three of them head off for the mill. Beta team crosses over a small bridge over looking the entrance to the mine. Stairs seem to be on the other side but not accessible from where they are. The continue further down the trail lined with torches and discover something that should not be there. A small 11 foot high castle. The castle doors are wide open and they could hear a woman screaming from within. With out thinking twice Andy unhooked his positron collider and ran into the castle. Will and Kevin looked at each other and shrugged. Then they as well dashed into the dark castle. 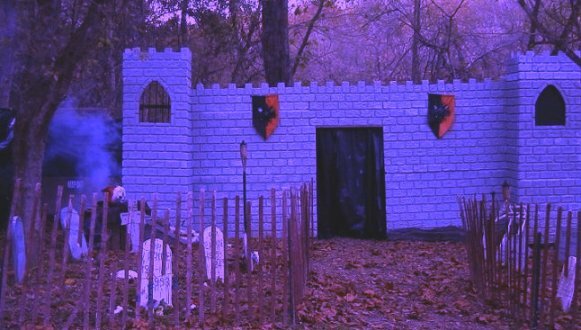 Once inside, they realize that this was no ordinary castle. From inside the grand foyer lined with human skulls and instruments of torture there was only one hallway. Judging by the echoes of the footsteps on the far side of the hall they quickly see they just walked into a trap. They turn around to leave and the massive oak doors swing closed under there own power and and the torches seemingly extinguished themselves. 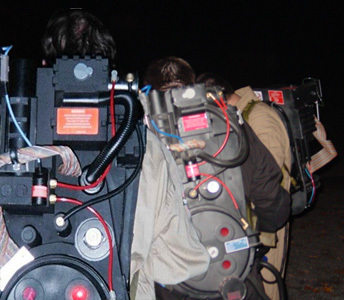 Now Beta team was completely enveloped in darkness save the pulsating blue and red light from their proton packs. 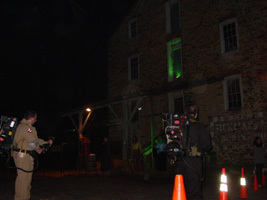 Bill, Rich, and Kyle walk toward the rear entrance of the mill. As they turn the corner they are confronted by a crowd of at least one hundred people. Alpha team is at a loss for words. They glance between the crowd and each other’s confused faces. Thinking they might have stumbled into some army of possessed Baccardio worshippers they cautiously walk toward the crowd. “Well come right this way, he’s been expecting you.” the short woman begins to push through the crowd. The people see the approaching crew. “Hey look it’s the Ghostbusters!” someone yells from the back of the crowd. The three Ghostbusters, now realizing that this is just a crowd gathered to watch, begin to wave and work the crowd. 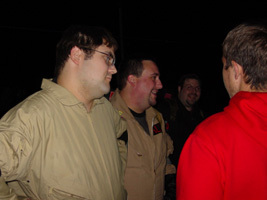 Rich takes a cue from Bill and yells to the audience, “Ladies and gentlemen, the heart of GHOSTBUSTERS- New Jersey, Bill Malkin!” Rich grabs Bill’s hand and waves it to the silent crowd. Just then a loud explosion is heard on the stage. The boys run up the stairs and are confronted by a stifling amount of smoke. Then the voice. Deep and raspy. “SILENCE MORTALS! The voice resonating from all around them. Bill, Rich, and Kyle pull and switch on their respective particle throwers. As the smoke settles a 300 pound man in standing there wearing a midnight blue robe and matching pointed hat both with gold stars and crescent moons sewn onto them. The massive man lumbers forward and extends his hands toward the guys. Bill nods toward rich then to Kyle, “On 3, 1…2…wait for it.” Except Kyle didn’t wait. 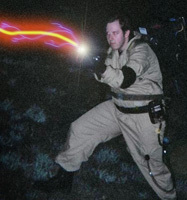 The ion stream fired at the head of the wizard. The fat wizard ducked as the stream went wide and struck a stack of hat bales setting them ablaze.